Every crisis between India and Pakistan since the mid-1980s, real or imagined, has been connected in some way to nuclear weapons. The specter of nuclear warfare on the subcontinent has, to date, succeeded in deterring the least likely but most consequential contingencies: a major conventional war and a crossing of the nuclear threshold in conflict. Offsetting nuclear capabilities have not deterred lesser contingencies, including limited conventional war and acts of cross-border terrorism that have sparked serious crises. The conditions for another crisis remain in place, as is evident from the intensity of firing along the Line of Control (LoC) dividing Kashmir, the level of public disaffection among Kashmiri Muslims under Indian governance, suicide attacks against Indian military posts and bases by Muslim extremist groups, and, most notably, publicized “surgical strikes” across the LoC announced by Prime Minister Narendra Modi’s government in September 2016. If Modi’s action was meant to shore up domestic support, he succeeded. If his action was meant to stop the pattern of low-level violence across the LoC and the actions of anti-India extremist groups, he has failed to do so. The focus of this essay is crises between India and Pakistan, which have a far greater potential for escalation than crises between India and China or between Pakistan and Afghanistan. The next crisis between India and Pakistan could arise from a dramatic act of terrorism, a prolonged deterioration in bilateral relations marked by increasingly violent military clashes, or a pattern of increasingly bold strikes by cadres based in Pakistan that champion the Kashmir cause. Conversely, a serious crisis could occur through the actions of spoilers that seek to disrupt efforts by Indian and Pakistani leaders to improve ties. Whatever the scenario for another nuclear-tinged crisis, there will be a pressing need for crisis management to avert warfare and unintended escalation. Given the deterioration of India-Pakistan relations, negative trend lines on the subcontinent, and the degree of difficulty involved in improving bilateral relations, conditions are ripe for another crisis. This essay begins by briefly reviewing five crises between India and Pakistan: (1) the 1987 Brasstacks crisis, (2) the 1990 Compound crisis, (3) the 1999 Kargil War, (4) the 2001-2 Twin Peaks crisis, and (5) the 2008 Mumbai crisis. We suggest reasons why these crises re-occur on the subcontinent. In a second section, we assess nuclear signaling in the five crises and the intensity of such signaling. In a third section, we examine how evolving nuclear capabilities might affect the subcontinent’s crises and future crisis management efforts. In our final section, we consider changes in the international environment, particularly with regards to changes in U.S. and Chinese relations with India and Pakistan, that may alter future crisis management dynamics. We conclude that a careful examination of these factors will be critical to informing, tailoring, and implementing effective crisis management strategies on the subcontinent. There have been five crises so far between India and Pakistan under the shadow of nuclear weapons. The first was sparked by Operation Brasstacks in 1986-87, during which an adventurous Indian army chief, Gen. K. Sundarji, carried out large-scale military exercises near Pakistan’s border. Some analysts viewed these maneuvers as a last-ditch attempt to prompt a war that would allow India to destroy Pakistan’s nascent ability to produce nuclear weapons.1Raj Chengappa, Weapons of Peace: The Secret Story of India’s Quest to Be a Nuclear Power (New Delhi: Harper Collins, 2000), 322-24; S.S. Gill, The Dynasty: A Political Biography of the Premier Ruling Family of Modern India (New Delhi: Harper Collins, 1996), 474-80; P.N. Hoon, Unmasking the Secrets of Turbulence (New Delhi: Manas Publications, 2000), 102-12; George Perkovich, India’s Nuclear Bomb: The Impact on Global Proliferation (Berkeley: University of California Press, 1999), 280; Ravi Rikhye, The War that Never Was (New Delhi: Chanakya Publications, 1988); and P.R. Chari, Pervaiz Iqbal Cheema, and Stephen P. Cohen, Four Crises and a Peace Process: American Engagement in South Asia (Washington, D.C.: Brookings Institution Press, 2007), 46-47. For this case to be persuasive, there must be evidence that Sundarji’s troops were fully equipped with supplies and ammunition sufficient to carry out a successful campaign. All subsequent nuclear-tinged crises have been prompted by actions originating from within Pakistan. The Compound crisis of 1990 drew its name from multiple intertwined security challenges: a large-scale Pakistani military exercise — planned by another risk-taking army chief Gen. Mirza Aslam Beg — along with significant unrest fostered by Pakistan’s intelligence services in the Kashmir Valley and the Indian state of Punjab. The Indian government responded with military countermoves, prompting high-level U.S. crisis management that dovetailed with decisions by leaders in both countries to de-escalate.2For more on the 1990 Compound crisis, see Zachary S. Davis, ed., The India-Pakistan Military Standoff: Crisis and Escalation in South Asia (New York: Palgrave Macmillan, 2011). Other useful sources include Michael Krepon and Mishi Faruqee, eds., Conflict Prevention and Confidence-Building Measures in South Asia: The 1990 Crisis (Washington, D.C.: Stimson Center, 1994); and Chari, Cheema, and Cohen, Four Crises and a Peace Process, 80-117. A harrowing crisis between India and Pakistan took place within one year of the 1998 nuclear tests, sparked by the decision of Pakistan Chief of Army Staff Gen. Pervez Musharraf and a few military confidantes to seize ground across the Kashmir divide. Operating in winter, when Indian forward posts were unmanned, Pakistan’s Northern Light Infantry troops advanced to the heights above Kargil, whereupon discovery, their ground positions were contested by Indian infantry, artillery, and airpower. Leaders in both countries sought to keep the Kargil War limited in geographic scope and intensity. U.S. crisis management was also instrumental in reinforcing the limited nature of this conventional conflict and in orchestrating the reestablishment of the status quo ante.3 Recommended readings for the Kargil crisis include the contributors in Peter R. Lavoy, ed., Asymmetric Warfare in South Asia: The Causes and Consequences of the Kargil Conflict (New York: Cambridge University Press, 2009); Neil Joeck, “The Kargil War and Nuclear Deterrence,” in Nuclear Proliferation in South Asia: Crisis Behavior and the Bomb, ed. Sumit Ganguly and S. Paul Kapur (New York: Routledge, 2009), 117-143; Kargil Review Committee, From Surprise to Reckoning: The Kargil Review Committee Report (New Delhi: Sage Publications, 1999); Jasjit Singh, ed., Kargil 1999: Pakistan’s Fourth War for Kashmir (New Delhi: Knowledge World, 1999); V.K. Sood and Pravin Sawhney, Operation Parakram: The War Unfinished (New Delhi: Sage Publications, 2003); and Bruce Riedel, American Diplomacy and the 1999 Kargil Summit at Blair House (Philadelphia: University of Pennsylvania, 2002). For perspective on how Kargil could serve as a paradigm for future conflict, refer to Bruce Riedel, “Tensions Rising Dangerously in South Asia,” Brookings Institution, October 19, 2014, http://www.brookings.edu/research/opinions/2014/10/19-tensions-rising-dangerously-southasia-riedel. In December 2001, an attack on the Indian Parliament building by cadres belonging to either Jaish-e-Mohammad (JeM) or Lashkar-e-Taiba (LeT) militant groups (or both) sparked another intense crisis, prompting large-scale mobilizations. Another attack five months later on housing facilities for Indian troops in Jammu resulted in a second spike of significant tension, hence the name of the Twin Peaks crisis. U.S. crisis management proved critical in reinforcing Indian Prime Minister A.B. Vajpayee’s decision not to go to war.4For perspectives and analyses of the Twin Peaks crisis, see Praveen Swami, “A War to End a War: The Causes and Outcomes of the 2001-2 India-Pakistan Crisis,” in Nuclear Proliferation in South Asia, 144-162; Kanti Bajpai, “To War or Not to War: The India-Pakistan Crisis of 2001-2,” in Nuclear Proliferation in South Asia, 162-82; Polly Nayak and Michael Krepon, The Unfinished Crisis: US Crisis Management after the 2008 Mumbai Attacks (Washington, D.C.: Stimson Center, 2012); and Davis, ed., The India-Pakistan Military Standoff. A period of six years passed before the next significant crisis, triggered this time in Mumbai by attacks on luxury hotels, the central train station, and a Jewish community center. The perpetrators belonged to LeT. Following the 2008 Mumbai attacks, there were no troop mobilizations. Once again Pakistan was widely criticized for providing safe havens for groups engaged in cross-border terrorism, being unwilling or unable to prevent them, and failing to successfully prosecute those who aided in the planning and execution of these attacks. While U.S. officials again helped with crisis management, their task was simplified by the evident reluctance of Prime Minister Manmohan Singh and his close advisers to risk India’s economic growth prospects in a war with Pakistan.5For assessments of the 2008 Mumbai crisis, see Seth G. Jones et al., The Lessons of Mumbai (Santa Monica: RAND Corporation, 2009); Nayak and Krepon, The Unfinished Crisis; and B. Raman, Mumbai 26/11: A Day of Infamy (New Delhi: Lancer, 2012). As of this publication, there has not been another major crisis since the 2008 Mumbai crisis.6This assessment uses a different definition of “crisis” than the essay by Sameer Lalwani and Hannah Haegeland in this volume, “Anatomy of a Crisis: Hypotheses on India-Pakistan Crisis Onset.” There has, however, been a pattern of continued violence along the LoC as well as sporadic attacks on Indian military posts and bases by extremist groups committed to the Kashmiri cause. In January 2016, suspected JeM militants stormed an Indian Air Force base in Punjab, killing seven security personnel.7Rama Laskshmi, “Indians Battle Militants at Key Airforce Base,” The Washington Post, January 4, 2016. Eight months later, another attack on an Indian Army base in Kashmir killed 19 Indian soldiers, making it the deadliest attack on Indian forces in over two decades.8 Prakash Nanda, “Uri Terror Attack: Three Lessons for India from One of the Worst Strikes This Century,” Firstpost, September 19, 2016; and Rama Laskshmi. “Indian Army Suffers Worst Strike in Years to Militants, as 17 Soldiers Die in Kashmir,” The Washington Post, September 18, 2016. In response to these provocations, Prime Minister Modi gave a speech advocating strategic restraint, privileging a diplomatic approach over military action.9 Praveen Swami, “In PM Modi Kozhikode Speech, a Powerful Case for Strategic Restraint,” The Indian Express, September 26, 2016. Modi had, however, already authorized “surgical strikes” led by special forces troops against militant camps across the Kashmir divide, a strategy that seemed to indicate Modi’s intent to send a warning signal while wishing to prevent uncontrolled escalation.10 Shishir Gupta, “Mission LoC: How India Punished Pakistan with Surgical Strikes,” Hindustan Times, October 3, 2016. This sequence of events suggests the pattern of violence that preceded the 2001-2 Twin Peaks crisis, when a series of small-scale attacks was followed by a truck bombing of the State Assembly building in Srinagar and then an attack on the Indian Parliament building. The 1987 Brasstacks crisis and the 1990 Compound crisis unfolded against the backdrop of offsetting nuclear capabilities that were presumed to exist but very hard to assess. After the 1998 tests that brought Indian and Pakistani bombs out of the basement, some analysts offered confident predictions of deterrence stability in the expectation that offsetting capabilities for mass destruction would temper risk-taking.11 See Michael Krepon, “The Stability-Instability Paradox, Misperception, and Escalation Control in South Asia,” in The Stability-Instability Paradox: Nuclear Weapons and Brinksmanship in South Asia, ed. Michael Krepon and Chris Gagné (Washington, D.C.: Stimson Center, 2012), 3-6. These hopes were quickly dashed. Growing nuclear weapon stockpiles and a succession of new Indian and Pakistani missiles capable of delivering nuclear weapons have neither stabilized deterrence nor backstopped diplomatic initiatives to improve bilateral relations. Instead, diplomacy has stagnated while nuclear capabilities have steadily advanced.12Ibid., 10. Several conclusions seem warranted from the substantial literature on crises between India and Pakistan in the three decades following Operation Brasstacks. First, crises continue to occur because they do not resolve issues in dispute. The last “successful” war on the subcontinent (from India’s vantage point) greatly exacerbated Pakistani grievances against India, setting the stage for subsequent crises. “Successful” wars now appear inconceivable with the advent of significant offsetting nuclear capabilities. However, limited wars remain possible and — as was evident in the Kargil conflict — have the potential to escalate. If a limited war does not escalate, then it is more likely to result in a stalemate than to prompt important changes to the status quo. And if the outcome of a limited war reinforces the status quo, it would only reinforce mutual grievances, as was the case with the Kargil conflict. Second, crises have not prompted intensive and sustained diplomatic effort to reconcile differences. Absent a commitment to diplomacy to resolve issues in dispute, grievances and the potential for crisis will remain.13See Riaz Khan’s assessment on what is required diplomatically to change this cycle of recurring crises in his essay in this volume, “Conflict Resolution and Crisis Management: Challenges in Pakistan-India Relations.” Indeed, as noted above, crises have reoccurred because they have added to, rather than diminished, underlying grievances. Consequently, India and Pakistan have been stuck in an extended negative feedback loop of grievances and crises without resolution. At the same time, the frequency of crises is hard to predict. Sometimes they follow closely after each other; at other times, there can be a long hiatus between crises. There is, as of yet, insufficient evidence about the frequency of crises to draw confident conclusions. Lastly, crises have provided an impetus to nuclear modernization programs, upping the stakes for the next crisis. However, there is no evidence that an accelerated nuclear competition has affected the outcome of any crisis, in part because the contestants remain largely in the dark as to each other’s actual capabilities. Indicators relating to conventional and nuclear forces merge during crises on the subcontinent in part because some combat aircraft and missile types can deliver both conventional ordnance as well as nuclear weapons. Moreover, increased readiness related to conventional forces can sometimes trigger steps to increase the readiness of nuclear capabilities. Thus, for our purposes, the intensity of a crisis includes actions related to both conventional and nuclear arms. Signaling by means of conventional military forces could range from preparations for limited military action to significant troop mobilization. As conventional indicators intensify, nuclear indicators are likely to intensify as well. These steps have had, and could have in the future, clear escalatory potential. Because large-scale troop mobilizations can be precursors to war, they are clear indicators of the severity of a crisis. Large-scale military exercises could also mask preparations for war, prompting countermoves. Key indicators for mobilizations and large-scale military exercises include canceling leaves, requisitioning trains to move troops and heavy equipment toward fighting corridors, moving entire strike corps to forward holding areas, and moving ammunition to supply forward-deployed troops. When these indicators are evident, a very serious crisis is unfolding. A serious crisis can also be marked by missiles movements and, if the crisis extends long enough, by missile flight tests conducted to send deterrent messages. In a serious crisis, steps will be taken to increase the readiness of nuclear-capable delivery vehicles in visible ways. For example, missiles and their accompanying security and equipment needs can be moved out of garrisons and storage facilities. While these steps might not conclusively indicate the intentions of an adversary, in the heat of a crisis, these indicators are more likely to be viewed through the prism of a worst-case scenario — as preparations for launch rather than as defensive measures. Likewise, the mating of warheads to delivery vehicles — if they can be identified — would be an extremely serious development in a deep crisis. The weight attached to nuclear signaling depends significantly on the status of conventional forces during a crisis. The movements of nuclear delivery vehicles are far more worrisome when accompanied by large-scale mobilizations and military exercises. Only the extended Twin Peaks crisis was accentuated by flight tests.14For more on missiles and nuclear risk reduction, see Toby Dalton and Jaclyn Tandler, Understanding the Arms “Race” in South Asia (Washington, D.C.: Carnegie Endowment for International Peace, 2012); Feroz H. Khan, “Nuclear Signaling, Missiles, and Escalation Control in South Asia,” in Escalation Control and the Nuclear Option in South Asia, ed. Michael Krepon, Rodney W. Jones, and Zaid Haider (Washington, D.C.: Stimson Center, 2004), 75-100; W.P.S. Sidhu, “India’s Security and Nuclear Risk-Reduction Measures,” in Escalation Control and the Nuclear Option, 1-46; and Kent L. Biringer, “Missile Threat Reduction and Monitoring in South Asia,” in Escalation Control and the Nuclear Option, 59-82. The absence of missile flight tests during the 1990 Compound crisis and 1999 Kargil War helped prevent these events from becoming more severe. The 2008 Mumbai crisis was too short to accommodate the preparations necessary for missile flight testing. While we argue below that three of the five crises examined exhibit more credible forms of signaling with nuclear capabilities, the import of these signals is subject to debate. Feroz Khan, for example, notes that while conventional forces have been placed on high alert and mobilized in crises, there has been “no evidence of increased nuclear alert status” or operational deployment in the manner of the United States and Soviet Union during the Cold War.15Khan, “Nuclear Signaling,” in Escalation Control and the Nuclear Option, 75-100. We acknowledge difficulty in determining with exactitude the intensity of nuclear signaling, in part because officials in Pakistan — having more reason to send such signals than India, which enjoys conventional military advantages — have hyped nuclear dangers during crises in order to engage U.S. crisis managers only to downplay nuclear dangers once the crisis has passed to convey the message of responsible nuclear stewardship.16Vipin Narang, “Posturing for Peace? Pakistan’s Nuclear Posture and South Asian Stability,” International Security 34, no. 3 (2009/10): 38-78. It is also quite possible that readiness levels for the use of nuclear weapons might differ from one state to the next, making it hard to assess the status of nuclear forces, including for intelligence agencies, which may well have been the case during the 1990 Compound crisis.17Seymour H. Hersh, “On the Nuclear Edge,” The New Yorker, March 29, 1993, 64; and “Conflict Prevention and Risk Reduction: Lessons from the 1990 Crisis,” in, Nuclear Risk Reduction in South Asia, ed. Michael Krepon and Chris Gagné (New Delhi: Vision Books, 2003). We also acknowledge the difficulty for U.S. nongovernmental researchers to gain a granular appreciation for the intensity behind nuclear signaling during a crisis. However, decision-makers in India and Pakistan found themselves in similar straits, lacking sufficient national technical means to assess the status of opposing nuclear capabilities. Information that was shared during crises by U.S. officials has subsequently been contested, and most of those who have been in positions to know the intensity of signaling have been unwilling to share their impressions. Moreover, these impressions might have changed with the passage of time. Despite these uncertainties, decision-makers were impelled to factor nuclear dangers into their assessments during a crisis, as do we in this essay. Public statements — or “verbal pyrotechnics” in the apt phraseology of P.R. Chari, Pervaiz Iqbal Cheema, and Stephen P. Cohen — are not reliable indicators of the severity of crises.18P.R. Chari, Pervaiz Iqbal Cheema, and Stephen P. Cohen, The Compound Crisis of 1990: Perception, Politics, and Insecurity (Urbana: Program in Arms Control, Disarmament, and International Security, 2000), 111. These veiled and sometimes not-so-veiled threats might be employed to mollify a domestic audience, speed the intervention of crisis managers, or simply serve as a device to let off steam.19See Samuel Black, The Changing Political Utility of Nuclear Weapons: Nuclear Threats from 1970-2010 (Washington, D.C.: Stimson Center, 2010). See also Chari, Cheema, and Cohen, Four Crises and a Peace Process, 194-96. In states like India and Pakistan with raucous media and combative political parties, there are costs for appearing “soft” on an adversary and presumed benefits for employing heated language.20See James D. Fearon, “Domestic Political Audiences and the Escalation of International Disputes,” American Political Science Association 88, no. 3 (1994): 577-92. Likewise, not all officials are on the same page during a crisis, and disconnects between civil and military authorities are not uncommon on the subcontinent. While public rhetoric is not a reliable indicator of intensity, we do factor it into our assessments, as do other analysts.21Chari, Cheema, and Cohen, Four Crises and a Peace Process, 174. But it is important to keep in mind that rhetoric is less meaningful than conventional military moves and signaling with nuclear-capable delivery vehicles. Finally, actions taken by third parties could serve as indicators of crisis severity. For example, issuing travel warnings or evacuating nonessential staff at diplomatic missions can clearly communicate the perceived severity of a crisis and can help (knowingly or unknowingly) in crisis management, as was thecase with the evacuation of nonessential personnel from the U.S. and British Embassies in May 2002 during the Twins Peaks crisis.22Polly Nayak and Michael Krepon, US Crisis Management in South Asia’s Twin Peaks Crisis, 2nd ed. (Washington, D.C.: Stimson Center, 2014), 10-48. The following typology of dangerous indicators constitutes a list of ingredients rather than a recipe. New ingredients could be added as new military capabilities and tactics evolve. A “playbook” of indicators has gained its content from previous crises, but its application is likely to reflect the particulars of the crisis at hand. Multiple indicators of the severity of a crisis are likely to be present, while others could be held back for signaling purposes as a crisis unfolds. Among the measures that indicate the top-most tier of intensity in a crisis between India and Pakistan are the following: limited warfare between significant units of their armed forces, indications that missiles and nuclear warheads have been mated in the field, deployment in the field or in fighting corridors of missiles armed with nuclear weapons or dual-capable missiles, movement of nuclear-capable aircraft to satellite bases and positioned on runway alert, the stand-down of aircraft and other front-line equipment to prepare for combat, the mobilization of offensive and defensive units to fighting corridors with combat equipment and ammunition, and the cancellation of leaves. These indicators are unlikely to be singular; if a crisis has reached this level of extreme intensity, multiple indicators are likely present, suggesting a significant risk of escalation. Leaders wishing to signal their interest in restraint even when many indicators of an intense crisis are present can do so by not taking additional steps associated with readiness for nuclear weapons use. Under these harrowing circumstances, crisis management is still possible and urgently necessary. Among the indicators of a very serious crisis — but one that offers more room for creative de-escalatory crisis management — we would include large-scale military exercises in sensitive areas, the movement of some but not many missiles out of garrisons and some nuclear-capable aircraft to satellite bases, the movement of warships presumed to carry nuclear weapons out of port, and threatening statements by national leaders suggesting increased readiness to use nuclear weapons. A third rung of crisis intensity might include indicators like small-unit skirmishes between troops along the Kashmir divide characterized by an accentuated tempo of overrunning posts amid higher casualty counts, additional publicized cross-LoC raids and nationalistic media campaigns accompanying them,23For a discussion on the role of media in crisis escalation see the essay by Ruhee Neog in this volume, “Self-Referencing the News: Media, Policymaking, and Public Opinion in India-Pakistan Crises.” intensified small arms, rocket, and artillery fire across the Kashmir divide, an increased tempo of operations by anti-India groups linked to Pakistan’s military and intelligence services, public statements by national leaders conveying veiled or open nuclear threats, and an increased tempo of missile flight tests. These conditions are partly present in India and Pakistan at the time of this publication. This typology is dynamic rather than static. Leaders can take steps to “jump” rungs in response to triggering events. New indicators could be employed as nuclear capabilities and military tactics evolve. Of special note are the development and induction of short-range “tactical” nuclear weapons in Pakistan and nuclear-capable ground- and submarine-launched cruise missiles by both countries. The signals associated with these weapon systems have yet to appear, and when they do, they could be hard to read. Early on, it was difficult for Indian and Pakistani decision-makers to read each other’s signals because they did not possess the technical means to observe readiness measures. They relied on information gleaned by U.S. intelligence to fill information gaps, with the understanding that Washington could impart useful information as well as overreact to such indicators. The development and induction of new nuclear capabilities could well add to difficulties in assessing nuclear signals. The most serious stage of the Brasstacks crisis was marked by aggressive military maneuvers that could have been interpreted as either a prelude or provocation to conflict. The crisis began in 1986 during one of India’s triennial military exercise programs, Operation Brasstacks, in the western state of Rajasthan. According to some accounts, India and Pakistan shared a “semi-formal understanding” regarding large-scale military maneuvers and exercises and that letters formalizing this agreement were exchanged on a “semi-official basis.”24Chari, Cheema, and Cohen, Four Crises and a Peace Process, 41. However, one senior Indian military official noted that Gen. Sundarji might have been unaware of this agreement at the time of the Brasstacks crisis.25Ibid. The initiation of the crisis centered on the mobilization of some 250,000 Indian troops and 1,300 tanks — according to Pakistani estimates — along the India-Pakistan border in a way that caused sufficient concern within Pakistan that India could reorient its forces to bisect the country.26Ibid., 44. Some Indian railway routes were commandeered to move troops and heavy equipment, and strike corps carried ammunition with them to forward posts.27Ibid., 49. While lines of communication remained open on both sides through multiple channels, Indian information sharing was “uncooperative and evasive.”28Ibid., 52. Pakistan responded by moving two strike corps closer to the border dividing the Pakistani state of Punjab and crossed the Sutlej River in January 1987 in a move that “seriously alarmed” Indian policymakers, as this mobilization simultaneously threatened both Kashmir and the Indian state of Punjab.29Ibid., 39, 54. India immediately took counter-defensive positions along the border, reinforced by a substantial airlift, and set off “war hysteria” in each country’s national media.30Ibid., 55. When the potential severity of the crisis became clear to Indian Prime Minister Rajiv Gandhi, he took actions clarifying India’s non-hostile intent — including the transfer of Sundarji’s closest civilian confidante, Arun Singh, away from the Ministry of Defense. Experienced diplomats on both sides — with an assist from Pakistan’s leader, Gen. Zia-ul-Haq, who visited India to attend a cricket match — worked out the phased return of soldiers to their barracks. Third parties, especially the United States, did not appear to overreact, nor did they play a significant crisis management role. Neither state possessed nuclear weapons during this crisis, so nuclear signaling was inferential at most. There were, however, aspects of this crisis with nuclear connotations. According to one chronicler, Sundarji subsequently conveyed his intent “to defeat Pakistan by conventional arms before the latter acquired a nuclear deterrent that would make all-out war impossibly dangerous for both sides.”31Ibid., 67. This characterization has been disputed. If this was indeed Sundarji’s intention, his plan appeared to depend on Pakistan’s striking the first blow prior to indicators of an imminent attack. If the idea behind Operation Brasstacks was to be a prod, the Pakistan Army General Headquarters in Rawalpindi declined to overreact. For this characterization of the crisis to be convincing, Sundarji would have had to transport sufficient stocks of supplies and ammunition to engage in a war of choice rather than a large-scale military exercise. One of Sundarji’s close aides during the crisis denies this to have been the case.32Michael Krepon’s interview with a close Sundarji aide, New Delhi, August 10, 2017. The Indian government has not shed light on this matter, nor have individuals in a position to know gone on the public record with respect to this crucial indicator of intent.33Accounts of live ammunition involved in Operation Brasstacks include Chari, Cheema, and Cohen, Four Crises and a Peace Process, 49; John H. Gill, “Brasstacks: Prudently Pessimistic,” in Nuclear Proliferation in South Asia, 40; and P.N. Hoon, Unmasking Secrets of Turbulence: Midnight Freedom to Nuclear Dawn (New Delhi: Manas Publications, 1999), 109. The presence of sufficient supplies and ammunition would confirm what has become conventional wisdom about the escalation dangers associated with Operation Brasstacks. If ammunition in sufficient quantities to carry out an offensive did not accompany Sundarji’s troops in the field, however, then conventional wisdom is overblown. Indeed, if Sundarji’s troops were equipped to train but not to fight, and if this information had been conveyed to Pakistani leaders, it could have diminished the intensity of this crisis much earlier. As this matter remains hazy three decades after Operation Brasstacks, it is difficult to assess the actual intensity of this crisis. Lingering impressions offer florid accounts of Pakistani messaging with strong nuclear overtones. In a January 1987 meeting between Pakistan’s Minister of State for Foreign Affairs Zain Noorani and the Indian High Commissioner in Islamabad S.K. Singh, Singh recalled being warned that Pakistan was “capable of inflicting unacceptable damage” not just on northern India but also beyond. In Singh’s recollection, Noorani “made no attempt to deny that he was implying an attack on Bombay (now Mumbai), where India’s premier nuclear facilities are located.”34Varun Sahni, “A Dangerous Exercise: Brasstacks as Non-nuclear Near War,” in Nuclear Proliferation in South Asia, 21. The second instance of messaging was haphazard. During the crisis, Indian journalist Kuldip Nayar interviewed A.Q. Khan, the garrulous head of Kahuta Research Laboratories, Pakistan’s uranium enrichment facilities. Their meeting appeared to have an impromptu character, rather than one arranged to send a purposeful signal. In any event, one of Khan’s messages — “[w]e are here to stay and let it be clear that we shall use the bomb if our existence is threatened” — was not privately conveyed to Indian leaders during the crisis or, for that matter, to the reading public until after the crisis was over, when Nayar placed his piece in a London paper.35Kuldip Nayar, “We Have the A-bomb Says Pakistan’s Dr. Strangelove,” The Observer, March 1, 1987, 13. In Operation Brasstacks, nuclear signaling was more bravado than fact. Pakistan did not yet appear to possess an operational capability to deliver nuclear weapons, and India lagged behind Pakistan in this regard. However, the Brasstacks crisis did set a template for subsequent crises in that it served as a prod to accelerate nuclear capabilities. As the dean of Indian strategic analysts, K. Subrahmanyam, later observed, Sundarji’s grand military exercise backfired. It “provided a very convenient cover for Pakistan to unveil its nuclear weapons to the world.”36K. Subrahmanyam, “Indian Nuclear Policy — 1964-98 (A Personal Recollection),” in Nuclear India, ed. Jasjit Singh (New Delhi: Knowledge World, 1998), 42. The unveiling actually occurred a decade later, after India tested its nuclear devices. Sumit Ganguly and Devin Hagerty noted that the 1990 Compound crisis constituted a “bridge” between the pre-nuclear and post-nuclear eras in South Asian history.37Sumit Ganguly and Devin T. Hagerty, Fearful Symmetry: India-Pakistan Crises in the Shadow of Nuclear Weapons (Seattle: University of Washington Press, 2006), 82. Like Brasstacks, the Compound crisis was also instigated by a large-scale military exercise, this time by the Pakistani army chief. This mobilization — combined with internal unrest in Punjab and Indian-administered Kashmir fomented by Pakistani intelligence services — led to another tense military standoff. By 1990, both states appeared to have nuclear weapon capabilities, with Pakistan possessing more of an operational capability than India.38Chari, Cheema, and Cohen, Four Crises and a Peace Process, 99. Emphasis in original. According to Raj Chengappa’s heavily sourced account, Indian intelligence sources gave Prime Minister Gandhi “incontrovertible evidence” that Pakistan possessed an operational nuclear weapon delivery capability in October 1988.39Chengappa, Weapons of Peace, 331. Air Commodore Jasjit Singh dates this capability one year earlier.40Jasjit Singh, “Why Nuclear Weapons?” in Nuclear India, 20. The Kargil Review Commission, led by Subrahmanyam, reported that “in August 1990, Indian intelligence obtained information that Pakistan had developed a policy of using [nuclear] weapons as a first resort in case of war.”41Kargil Review Committee, From Surprise to Reckoning, 66. Subrahmanyam recollected that “in the period 1987-1990, India was totally vulnerable to the Pakistani nuclear threat.” But around the time of the 1990 Compound crisis, India was on the cusp of having nuclear weapon delivery capabilities. Subrahmanyam confirmed in his personal recollections published in 1998 that “the first Indian nuclear deterrent came into existence in early 1990.”42Subrahmanyam, “Indian Nuclear Policy,” in Nuclear India, 44; and Chari, Cheema, and Cohen, Four Crises and a Peace Process, 100. However, during the crisis Pakistani leaders talked in ways that reflected more confidence in their nuclear program. In the middle of the crisis, Pakistani Foreign Minister Sahibzada Yakub Khan visited New Delhi and spoke in extravagant terms to Indian Prime Minister V.P. Singh and Foreign Minister I.K. Gujral, hinting that the tense situation in Kashmir could get far worse and that extreme dangers could be in the offing. (Prime Minister Benazir Bhutto made matters worse by visiting Muzaffarabad and calling for a “holy jihad” over Kashmir.) Yakub Khan subsequently downplayed his messaging in New Delhi, while the Kargil Review Commission report relays that V.P. Singh and Gujral took the Pakistani Foreign Minister’s démarche “as an ultimatum.” Subrahmanyam notes that, “[t]he Indian Air Force was put on alert,” although whether this was done in response to Yakub Khan’s démarche is not clear.43Chari, Cheema, and Cohen, Four Crises and a Peace Process 45. Also see Kargil Review Committee, From Surprise to Reckoning, 65; and Gaurav Kampani, “New Delhi’s Long Nuclear Journey,” International Security 38, no. 4 (2014): 79-114. An important book-length account of India’s nuclear program written by George Perkovich assesses that India had two dozen or more fissile material cores ready for mating by the time of the Compound crisis. India apparently possessed no dedicated means of delivering these cores because of dysfunctional relations between its nuclear enclave and its military leadership.44Perkovich, India's Nuclear Bomb,293. They would have been inserted into bulky devices of unproven design only deliverable by improvised means.45Chengappa, Weapons of Peace, 357. Raj Chengappa’s account suggests that an improvised deterrent could have been readied during the crisis.46 Ibid., 357. Another account by civil servant B.G. Deshmukh suggests that Indian planning during the crisis proceeded on the basis of not using nuclear weapons.47B. G. Deshmukh, A Cabinet Secretary Looks Around (Mumbai: Bharatiya Vidya Bhavan, 1998), 70. Whatever the state of India’s deterrent in 1990, it most certainly lagged behind Pakistan’s — although some Indian leaders might well have disbelieved this. V.P. Singh, for example, stated that if Pakistan were to deploy nuclear weapons, India would follow suit.48Ganguly and Hagerty, Fearful Symmetry, 93. However, Pakistan’s advantages were quite real: Rawalpindi had in its possession a functional and deliverable first-generation bomb design courtesy of China.49Feroz H. Khan, Eating Grass: The Making of the Pakistani Bomb (Stanford: Stanford University Press, 2012), 157. Additionally, in 1990 — perhaps related to the Compound crisis — Pakistan apparently resumed enriching uranium to weapons-grade, breaking its pledge to the Reagan administration not to do so.50Nayar, “We Have the A-bomb.” In former U.S. Ambassador to Pakistan Robert Oakley’s recollection, after possibly down-blending highly enriched uranium in response to earlier U.S. démarches, Pakistan resumed 90 percent enrichment “in early 1990” just as the tensions peaked during the Compound crisis.51See remarks by Ambassador Robert Oakley in “Conflict Prevention and Risk Reduction: Lessons from the 1990 Crisis,” in Nuclear Risk Reduction in South Asia, 196; remarks by Ambassador Abdul Sattar in Nuclear Risk Reduction in South Asia, 231; remarks from Robert B. Oakley in Krepon and Faruqee, eds., Conflict Prevention and Confidence-Building Measures in South Asia, 45. Also see Perkovich, India’s Nuclear Bomb, 293-308; Devin T. Hagerty, The Consequences of Nuclear Proliferation: Lessons from South Asia (Cambridge: MIT Press, 1998), 133-70; Naeem Salik, The Genesis of South Asian Nuclear Deterrence: Pakistan’s Perspective (London: Oxford University Press, 2009), 125-30; Chari, Cheema, and Cohen, Four Crises and a Peace Process, 100-7; and Hersh, “On the Nuclear Edge,” 64. It was not surprising, then, that signaling during the Compound crisis was mostly one-sided, reflecting both a reasonable Pakistani assumption of its advantageous nuclear posture and its concerns over the outbreak of a conventional war. During the crisis, Pakistani decision-makers took visible steps to indicate heightened readiness to use nuclear weapons, although the extent of such preparations is subject to debate.52For more on this debate, see Chari, Cheema, and Cohen, Four Crises and a Peace Process, 99-108; and Krepon and Faruqee, eds., Conflict Prevention and Confidence-Building Measures in South Asia, 45. Seymour Hersh wrote an overheated account of this crisis in The New Yorker, which was subsequently recycled by William Burroughs and Robert Windrem.53Hersh, “On the Nuclear Edge,” 56-73; and William E. Burrows and Robert Windrem, Critical Mass: The Dangerous Race for Superweapons in a Fragmenting World (New York: Simon and Schuster, 1994). Hersh reports that Pakistan ostentatiously placed nuclear-capable F-16 aircraft on runway alert and carried out unusual activity around the Kahuta enrichment complex. While some of Hersh’s details appear overdramatized, there seems little doubt that Pakistan sought to exploit the presumption of its having nuclear weapon capabilities during the crisis to apply leverage on New Delhi and to seek Washington’s intervention.54Krepon and Faruqee, eds., Conflict Prevention and Confidence-Building Measures in South Asia, 45. According to Feroz Khan’s account in Eating Grass, the promised delivery of 28 F-16 fighter aircraft from the United States would have provided Pakistan with its first “operationally reliable” method of delivery of nuclear weapons in the early 1980s. However, the transfer was halted in 1990 by the imposition of the 1985 Pressler Amendment. This interpretation of Pakistan’s actions during the Compound crisis aligns with what Vipin Narang terms a “catalytic” nuclear posture — one relying on nuclear moves aimed at “catalyzing” a third party — in this case, the United States — to de-escalate the crisis.55Narang, “Posturing for Peace.” Narang considers the Compound crisis the “most explicit example” of Pakistan’s utilization of a catalytic posture.56Ibid. Namely, Pakistan “triggered” a U.S. intervention by deliberately signaling to the United States — more so than to India — that it was increasing its nuclear readiness. It was the most dangerous nuclear situation we have ever faced since I’ve been in the U.S. government. It may be as close as we’ve come to a nuclear exchange. It was far more frightening than the Cuban missile crisis.57Hersh, “On the Nuclear Edge,” 56. This is a striking statement and one that Kerr subsequently and privately acknowledged to one of the authors as being overly dramatic. The U.S. intelligence community was new to the business of assessing nuclear dangers during crises on the subcontinent and might have had difficulty assessing the degree to which Pakistan’s “nuclear antics” — an Indian characterization — were real or embellished.58Nirupama Rao, then Minister of External Affairs spokeswoman, used this phrase on May 26, 2002, during the Twin Peaks crisis as noted in Khan, “Nuclear Signaling,” in Escalation Control and the Nuclear Option, 75. Subrahmanyam recalls that “[t]here was a top-secret analysis in India on the probability of the Pakistani nuclear threat and it concluded that it was not very significant.”59Subrahmanyam, “Indian Nuclear Policy,” in Nuclear India, 45. Apparently, however, Pakistan’s signaling was deemed sufficient to warrant placing the Indian Air Force on alert. George Perkovich’s account also confirms that India was not “worrying explicitly about a nuclear threat from Pakistan” at that time and was unaware of the Pakistani activities detected by U.S. intelligence.60Perkovich, India’s Nuclear Bomb, 10. The Compound crisis, like Brasstacks, provided an impetus to both countries to further advance their nuclear capabilities, with the development and flight testing of missile programs taking on greater urgency. Pakistan took the brunt of U.S. disapproval. After the crisis, the George H.W. Bush administration invoked Pressler Amendment sanctions, as it was no longer able to certify that Pakistan was not in possession of a nuclear bomb. The resumption of Pakistan’s production of highly enriched uranium around the time of the Compound crisis removed the last fig leaf that had allowed the Reagan and Bush administrations to continue military support to Pakistan during the Afghan jihad against the Soviet Union. Did the nuclear tests conducted by India and Pakistan in May 1998 rule out a major conventional war between them? Possibly not; but only up to a given threshold, which margin was exploited by Pakistan.63Kargil Review Committee, From Surprise to Reckoning, 22. India activated all three types of nuclear delivery vehicles and kept them in what is known as Readiness State 3 — meaning that some nuclear bombs would be ready to be mated with the delivery vehicle at short notice. The air force was asked to keep Mirage fighters on standby. DRDO scientists headed to where Prithvi missiles were deployed and at least four of them were readied for possible nuclear strike. Even an Agni missile capable of launching a nuclear warhead was moved to a western Indian state and kept in a state of readiness.64Chengappa, Weapons of Peace, 437. U.S. accounts of the Kargil War have not independently confirmed these steps. If taken, they suggest that India’s leaders and its nuclear enclave were chastened by Pakistan’s advantages and their own lack of preparation during the 1990 Compound crisis. However, Chengappa’s sources might have overstated India’s ability to sustain nuclear readiness. At the time, the Prithvi missiles were liquid-fueled, and thus inherently difficult to maintain in a readiness status for nuclear attack because of liquid fuel’s corrosive properties and other maintenance challenges associated with such missiles. A more reliable and flexible option was the solid-fueled Agni, which had been successfully flight tested three times before the Kargil War. India also possessed a first-generation bomb design proven in the 1998 tests and presumably the means to deliver it by specially equipped aircraft. The U.S. intelligence community was closely following increased nuclear-related readiness during the Kargil War, presumably comparing these moves against the admittedly unclear baselines established during the Compound crisis. President Bill Clinton used the information gleaned by U.S. intelligence to place Prime Minister Nawaz Sharif, who was in the dark over increased nuclear readiness measures, in an untenable position during the Pakistani prime minister’s desperate trip to Washington over the July 4th holiday in search of an exit strategy.65For more on U.S. diplomatic pressure during the Kargil crisis, see Strobe Talbott, Engaging India: Diplomacy, Democracy, and the Bomb (Washington, D.C.: Brookings Institution Press, 2004); Khan, “Nuclear Signaling,” in Escalation Control and the Nuclear Option; Khan, Eating Grass; Riedel, American Diplomacy; and Chari, Cheema, and Cohen, Four Crises and a Peace Process, 118-48. Former Indian Minister of External Affairs Jaswant Singh recounts that the Indian side had indeed received some information that Pakistan was operationalizing its nuclear weapons, but it was considered a “desperate gambit.”66Chari, Cheema, and Cohen, Four Crises and a Peace Process, 136. Gen. V.P. Malik, India’s army chief during the Kargil crisis, claims that U.S. accounts of Pakistani nuclear preparations were an exaggeration.67Ibid., 141. To add to the confusion, Malik’s successor, Gen. S. Padmanabhan, publicly stated Pakistan had activated a nuclear base and threatened a nuclear attack on India.68Ibid. The Kargil crisis was accompanied by rhetorical volleys affirming readiness to use nuclear weapons, if the need arose. For example, Pakistani Foreign Secretary Shamshad Ahmad asserted, “[w]e will not hesitate to use any weapon in our arsenal to defend our territorial integrity.”69Celia W. Dugger, “Atmosphere Is Tense as India and Pakistan Agree to Talks,” The New York Times, May 31, 1999. For its part, India also did not rule out the use of nuclear weapons during the Kargil crisis. As then National Security Advisor Brajesh Mishra later noted, “[c]rossing the Line of Control (LoC) was not ruled out, nor was the use of nuclear weapons.”70“India Was Ready to Cross LoC, Use Nuclear Weapons in Kargil War,” Business Standard, December 3, 2015. After the crisis, Pakistani spokespersons denied undue readiness, and Feroz Khan has offered reasons why Washington might have overreacted by not being able to distinguish between offensive and defensive moves of nuclear-capable missiles.71Khan, “Nuclear Signaling,” in Escalation Control and the Nuclear Option, 86-87. It would certainly be in Pakistan’s interest to downplay nuclear signaling after the Kargil War, as this would serve a national narrative of responsible nuclear stewardship. But again these denials are hard to accept fully. If Pakistan increased its readiness posture for the Compound crisis, which entailed large-scale military exercises in fighting corridors but no fighting, it presumably would have increased nuclear readiness even more in the run-up to and during a limited conventional war with India. The 2001-2 Twin Peaks crisis was the longest-lasting crisis in South Asian contemporary history, with both militaries facing off at the border for almost a year.72Chari, Cheema, and Cohen, Four Crises and a Peace Process, 150. Throughout the duration of the crisis, both sides engaged in deliberate nuclear signaling. The attack on the Indian Parliament building in December 2001, coming on the heels of the Kargil War, prompted a vigorous Indian response. Five days after the Parliament attack, the Prime Minister Vajpayee-led government launched Operation Parakram, moving entire strike corps with equipment and ammunition to fighting corridors. Satellite airfields were readied, and the Eastern Fleet was repositioned in the event of an order to blockade Karachi Harbor. Rawalpindi scrambled to move forces from its western border with Afghanistan to take blocking action. Rhetorical volleys accompanied the troop movements. On the occasion of Pakistan’s National Day in March 2002, President Musharraf’s speech warned that India would be taught an “unforgettable lesson” if it started a war, a statement that Indian Defense Minister George Fernandes characterized as “childish.”73Rahul Roy-Chaudhury, “Nuclear Doctrine, Declaratory Policy, and Escalation Control,” in Escalation Control and the Nuclear Option, 105-6. For good measure, in an interview for the April 6, 2002, issue of the German weekly Der Spiegel, Musharraf stated that, as a factual matter, “as a last resort, the atom bomb is also possible.”74“Im Notfall Auch Die Atombombe” [As a Last Resort, the Atom Bomb Is Also Possible], Der Spiegel, April 8, 2002. New Delhi’s pointed rejoinder came in the form of a flight test of the Agni missile. The George W. Bush administration’s approach to crisis management entailed seeking to play for time by choreographing high-level visitors and eliciting promises from President Musharraf to clamp down on violent extremist groups.75Nayak and Krepon, US Crisis Management in South Asia’s Twin Peaks Crisis, 37-45. This strategy appeared to be working but did not lead to troop demobilizations, in part because there was no obvious de-escalatory device to walk back readiness levels. In addition, India had “snapped communications” between the two countries.76Chari, Cheema, and Cohen, Four Crises and a Peace Process, 149. The crisis peaked again in May 2002 when militants in Jammu struck at housing facilities for mobilized Indian troops and their dependents. A procession of threatening statements, missile moves, and missile flight tests followed. The situation appeared dire when Vajpayee visited the front and told his soldiers, “[t]he time has come for a decisive battle, and we will have a sure victory in this battle.”77Luv Puri, “Be Ready for Decisive Battle, PM Tells Jawans,” The Hindu, May 23, 2002. But Vajpayee followed his threat by traveling to a remote hill station for an official function and a “vacation.” The Bush administration again scrambled to renew crisis management efforts. The crisis petered out in the fall, when successful elections in the Indian state of Jammu and Kashmir provided an exit strategy for Indian troop mobilizations.78Nayak and Krepon, US Crisis Management in South Asia’s Twin Peaks Crisis, 37-45; and Chari, Cheema, and Cohen, Four Crises and a Peace Process, 159-160. By the time of the Twin Peaks crisis, there could be no doubt that both India and Pakistan possessed nuclear weapons capable of delivery by missiles as well as aircraft. Nuclear signaling was very purposeful during this crisis, befitting its intensity. Provocative public statements were exchanged inferring readiness to cross the nuclear threshold. Given the length of the crisis, missile flight testing figured prominently in signaling strategies. India tested the “Pakistan-specific” Agni II on the day of the Parliament attack (reflecting earlier preparations), followed by the Agni I and the BrahMos missile.79For more on Indian missile tests, see Dalton and Tandler, Understanding the Arms “Race”, 21-24; articles on individual Indian missiles on IHS Jane’s Aerospace, Defence, and Security website at https://www.ihs.com/products/janes-international-defence-review. html; and “Nuclear-Capable Missile Called ‘Flawless’ in Test,” The Los Angeles Times, December 13, 2001. Pakistan flight tested the Ghauri, Ghaznavi, Abdali, and Shaheen missiles.80For more on Pakistani missile tests, see Dalton and Tandler, Understanding the Arms “Race”, 21-24; and articles on individual Pakistani missiles on IHS Jane’s Aerospace, Defence, and Security website. Very high readiness levels for conventional warfare were presumably accompanied by readiness for nuclear weapon use. Early in the crisis, Indian Minister of Defense Fernandes noted publicly that India’s “missile systems are in position.”81“India’s Missile System in Position: Fernandes,” The Hindu, December 27, 2001. Whatever the nuclear readiness levels deemed necessary by Indian and Pakistani leaders were, their status was not publicly characterized during the crisis. Elements of missile readiness, including forward deployments of missiles lacking extended range — the Prithvi and the Hatf I and II — were evident for U.S. satellites to observe.82Chari, Cheema, and Cohen, Four Crises and a Peace Process, 173. However, Feroz Khan argues that Pakistan did not feel the need to put its nuclear forces on alert; rather, the crisis “gave Pakistan confidence in its nuclear deterrent and provided important lessons for nuclear planners.”83Feroz H. Khan, “Pakistan’s Nuclear Force Posture and the 2001-2002 Military Standoff,” in The India-Pakistan Military Standoff, 137-38. The most telling evidence of rising nuclear dangers during the Twin Peaks crisis was the directive issued by U.S. Ambassador to India Robert Blackwill for nonessential embassy personnel to leave the country.84Nayak and Krepon, US Crisis Management in South Asia’s Twin Peaks Crisis, 35-36. Blackwill’s directive was issued 17 days after the second spike of the Twin Peaks crisis. Removing large numbers of U.S. citizens in India in a shooting war with the potential of crossing the nuclear threshold was a logistical nightmare. Blackwill’s purpose was quite straightforward: to begin this process as soon as possible. Blackwill and others in the Bush administration believed that the second spike of the Twin Peaks crisis would likely lead to war. The removal of nonessential embassy personnel was therefore a prudent precautionary measure — and a signal to those contemplating a trip to India to stay away. Blackwill’s directive turned out to be an important de-escalatory measure, clarifying New Delhi’s difficulties in keeping the heat on Pakistan while trying to welcome foreign travelers and corporate investors to India. Prime Minister Vajpayee’s stirring speech to the troops in Jammu to be prepared for a decisive battle might have been hyperbole for the benefit of the Bush administration’s crisis managers, but this level of tension in an unresolved crisis lasting almost a year was also damaging to Indian prospects for economic growth. By inadvertently but successfully calling New Delhi’s bluff, Blackwill identified an important tool for future U.S. crisis managers. After six years without a major crisis, a terrorist attack at the heart of India’s largest city threatened to propel India and Pakistan toward nuclear escalation once again. Senior U.S. officials — veterans of the Twin Peaks crisis — again mobilized for crisis management, their task made easier by the clear unwillingness of Indian Prime Minister Singh to mobilize troops or engage in escalatory rhetoric. The Mumbai crisis was extremely embarrassing and frustrating for India, as the lack of preparedness of Indian security forces and the cruelty of the attackers played out in real time before a transfixed, horrified, and outraged domestic audience. The crisis also deeply embarrassed Pakistan, as phone conversations between the perpetrators and their handlers became publicly accessible after being intercepted by the Indian government. The perpetrators and their handlers were affiliated with LeT, a by-now familiar militant group with a history of support from Pakistan’s Inter-Services Intelligence. LeT continued to enjoy considerable freedom of action despite then President Musharraf’s pledges to clamp down on the group during the Twin Peaks crisis. Conventional wisdom after the 2001 Parliament attack held that “another terrorist outrage could easily trigger an Indian response.”85See Chari, Cheema, and Cohen, Four Crises and a Peace Process, 205. Bruce Riedel and Teresita Schaffer make similar predictions in “Expert Says US Should Help Revive India-Pakistan Peace Talks,” Voice of America News, January 20, 2011; and Teresita Schaffer, “Is There Life After Cricket?” South Asia Hand, April 1, 2011, http://southasiahand.com/pakistan/india-pakistan-isthere-life-after-cricket. But the response of the Singh-led coalition government to the deadly and spectacular Mumbai attacks was notably restrained. Pakistan’s Inter-Service Public Relations, the media wing of the armed forces, issued no press releases about heightened alert levels after the Mumbai attacks. To the contrary, the Pakistan Army let it be known to journalists that the Indian Army had not mobilized and that the ceasefire along the Kashmir divide, instituted after the Twin Peaks crisis, was still holding.86Nayak and Krepon, The Unfinished Crisis, 41; and Syed Irfan Raza, “Govt Convenes All Party Conference,” Dawn, December 1, 2008. In December 2008, as with the Twin Peaks crisis, Pakistani troops along the western border with Afghanistan were moved toward the India-Pakistan border. However, a Pakistani defense official characterized the movement as a simple redistribution of troops from “snowbound areas and places where operational commitments were less.”87Saeed Shah and Maseeh Rahman, “Pakistan Deploys Soldiers to Indian Border,” The Guardian, December 26, 2008. Somewhat heightened measures were apparently taken after a hoax phone call when someone posing as Indian External Affairs Minister Pranab Mukerjee was directly connected to Pakistani President Asif Ali Zardari, former Prime Minister Benazir Bhutto’s widow who had come to power in the 2008 elections as the standard bearer of the Pakistan People’s Party.88“A Hoax Call That Could Have Triggered War,” Dawn, December 6, 2008; and Nayak and Krepon, The Unfinished Crisis, 12-13, 44-45. Pressures for escalation built over the last two weeks of December when Pakistan’s new weak civilian government proved incapable of deflecting hawkish critiques, receiving little assistance from Rawalpindi. The Pakistani press reported air space violations by the Indian Air Force, with denials reported in the Indian media.89Nayak and Krepon, The Unfinished Crisis, 45; and Bibhudatta Pradhan and Khalid Qayum, “India Denies Its Planes Violated Pakistani Airspace (Update2),” Bloomberg, December 14, 2008. Both sides canceled military leaves and implemented increased air force and air defense alert postures as the Indian Army conducted seasonal exercises.90Nayak and Krepon, The Unfinished Crisis, 45-6; Richard A. Oppel Jr. and Salman Masood, “Pakistan Moves Troops amid Tension with India,” The New York Times, December 27, 2008. These steps were modest compared to previous crises. They were accompanied by a notable absence of reports of missile movements and telling preparations for conventional warfare. Unlike previous crises, direct official communication between Indian and Pakistani leaders continued, interspersed with rhetorical volleys. In the immediate aftermath of the Mumbai attacks, Prime Minister Singh appeared intent not to repeat Vajpayee’s decision to mobilize for war without the benefit of a “plan B.” Given the civil-military divide in Pakistan, President Zardari was as unable to influence the course of events in Pakistan as was Prime Minister Sharif during the Kargil War. Once again, U.S. crisis managers rose to the occasion, helped by much-improved ties with India as a result of the George W. Bush administration’s championing of a civil-nuclear deal for India. Pakistan was on the back foot throughout due to its inability or unwillingness to follow through with previous pledges that its soil would not be used to facilitate such attacks. The Bush administration’s crisis managers found it far easier to defuse the Mumbai crisis than the Twin Peaks crisis. New Delhi’s restraint served India well; Pakistan’s international standing and prospects for economic growth continued to decline while India’s continued to rise, backstopped by closer ties to the United States. Measuring the intensity of the five nuclear-tinged crises covered in this essay is an imprecise art, partly because some of the key steps taken by Pakistan and India have been difficult to ascertain. In addition, public reports and published studies of these crises may not be entirely correct. Nuclear deterrence rests on ambiguity, and some of the signals sent during crises were purposefully ambiguous. In particular, the mating of warheads with missiles during crises — an extreme indicator of intensity — can be hard to assess, as is whether nuclear weapons have been loaded on aircraft during a crisis. Mobilizations, on the other hand, cannot be ambiguous; they send a clear signal of the severity of a crisis. Uncertainties also extended to the state of adversarial nuclear capabilities, especially in the Compound crisis and the Kargil War. On balance, ambiguity likely has reinforced deterrence in past crises. As the authors of Four Crises and a Peace Process wrote, “mutual worst-case analyses ensured that for both sides the opponent’s capabilities loomed even larger than objective circumstances strictly warranted.”91Chari, Cheema, and Cohen, Four Crises and a Peace Process, 102. Looking back over these crises chronologically, miscalculation accompanying Operation Brasstacks could have led to war given how little New Delhi did to alleviate Pakistani concerns as the crisis built. The Compound crisis appears in retrospect to be less dangerous than some thought at the time. A limited war between two nuclear-armed states, as occurred in the heights above Kargil, was extremely dangerous even though India and Pakistan exercised significant measures of operational restraint to avoid escalation. The Twin Peaks crisis was also extraordinarily dangerous. For all the fireworks associated with the 2008 Mumbai crisis, its level of intensity was not high, as India’s leadership clarified early on that war was not an option. Rajesh Rajagopalan has argued that crises between India and Pakistan do not progress in a linear fashion.92Rajesh Rajagopalan, Second Strike: Arguments about Nuclear War in South Asia (New Delhi: Penguin Books, 2005), 127. This essay reaffirms Rajagopalan’s assessment. Focusing on measures that indicate the intensity of nuclear signaling, as noted in Table 1, a rank ordering of the five crises covered in this essay would place the Kargil War and the Twin Peaks crisis in the top tier, followed by Operation Brasstacks and the Compound crisis in the second tier, and the 2008 Mumbai crisis in the third tier. As more details emerge about these crises, this rank ordering could be subject to change. If, however, our rank ordering is correct, the high-water mark for risk-taking on the subcontinent since the advent of nuclear weapons occurred within the first three-to-four years of the 1998 nuclear tests. However, this too could change depending on the risk-taking behavior by Indian political and Pakistani military leaders in the future. No one can rest easy that the worst of South Asia’s nuclear-tinged crises is in the rearview mirror. Grievances have not been addressed as military capabilities as well as tactics continue to evolve. Major events on the subcontinent have a way of surprising leaders — including the onset and conclusions of wars — and could be beyond their capacity to control. Another risk-taking army chief in Pakistan or anti-India militant groups based in Pakistan could spark another serious crisis. A bold Indian prime minister could decide to escalate matters. If the Pakistan Army turns against anti-India groups, these groups might retaliate against targets in India as well as Pakistan, seeking to spark a catalytic war.93C. Christine Fair, Neil Malhotra, and Jacob N. Shapiro, “Islam, Militancy, and Politics in Pakistan: Insights from a National Sample,” Terrorism and Political Violence 22, no. 4 (2010); and Steve Coll, “Lakshar-e-Taiba,” The New Yorker, December 1, 2008. Disaffected Muslims in India could spark a crisis, as might aggrieved Muslims in Kashmir facing severe police crackdowns. Extended protests, especially violent protests, could draw a higher level of support from across the Kashmir divide — a familiar escalatory pattern. Additional surgical strikes could lead to retaliation in kind or escalation. Alternatively, Indian and Pakistani leaders might decide to seek reconciliation, prompting a fierce backlash from irreconcilables. The modernization, expansion, and development of new nuclear capabilities might significantly alter the nature of nuclear signaling in the next intense crisis on the subcontinent. Pakistan’s embrace of “full-spectrum deterrence” signals a confirmation of open-ended nuclear requirements to deter the possibility of Indian conventional warfare.94Toby Dalton and Michael Krepon, A Normal Nuclear Pakistan (Washington, D.C.: Stimson Center and Carnegie Endowment for International Peace, 2015), 15. For example, retired Pakistani Air Commodore Adil Sultan indicated Pakistan’s development of the Hatf IX or Nasr short-range delivery capability, first successfully tested in April 2011, would grant Pakistan “flexible deterrence options” to counter the conventional threat from India.95Mansoor Ahmed, Pakistan’s Tactical Nuclear Weapons and Their Impact on Stability, (Washington, D.C.: Carnegie Endowment for International Peace, 2016). Similarly, both India and Pakistan’s pursuit of multiple independently targe-table re-entry vehicles could further fuel vertical proliferation in the region. As accuracies improve, the lure of counterforce targeting could also increase.96Michael Krepon, Travis Wheeler, and Shane Mason, eds., The Lure & Pitfalls of MIRVs: From the First to the Second Nuclear Age (Washington, D.C.: Stimson Center, 2016), 13-14. Both countries are building out nuclear triads with the development and testing of submarine-launched missiles.97Dinakar Peri, “India’s Nuclear Triad Finally Coming of Age,” The Diplomat, June 12, 2014. India successfully launched its K-4 ballistic missile from a submerged barge in May 2014 with Pakistan successfully testing its first submarine-launched, nuclear-capable cruise missile, the Babur-3, in January 2017.98“Pakistan Fires ‘First Submarine-launched Nuclear-capable Missile,’” Reuters, January 9, 2017. India could also employ the BrahMos and Nirbhay cruise missiles from its sea-based deterrent and choose to deploy ballistic missile defenses, which would provide further impetus to Pakistan’s nuclear capabilities while adding another factor in crisis management calculations.99 “India’s Ballistic Missile Defence System: All You Need to Know,” The Times of India, February 12, 2017; “India Claims Missile Defence Milestone,” The Guardian, November 27, 2006; and Franz-Stefan Gady, “India Successfully Tests Prithvi Defense Vehicle, A New Missile Killer System,” The Diplomat, February 15, 2017. As both countries’ nuclear capabilities expand and diversify, nuclear signaling during crises could evolve as well. A broader spectrum of missile delivery systems would grant policymakers a wider range of options by which to engage in nuclear signaling. 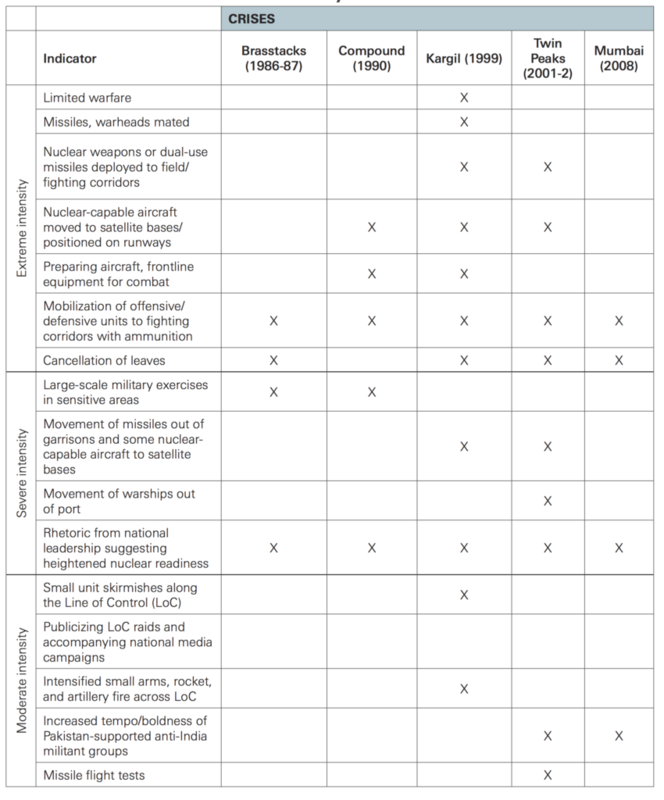 Where some previous crises were marked by the movement of short-and medium-range ballistic missiles, leaders in future crises could also employ longer-range missiles and sea-based capabilities to signal nuclear readiness. Several nuclear-capable delivery vehicles — such as Pakistan’s Nasr short-range missile and India’s supersonic cruise missiles — have yet to play roles in a crisis scenario. Rules of engagement could be of critical importance in the event of limited warfare, as both systems are dual capable and could be considered high-priority targets for air force pilots. The timeframe for decision-making regarding nuclear signaling and responses could well be compressed in a future crisis. Uncertainty regarding the deployment and alert level of varied nu-clear-capable assets could prompt leaders to make rapid decisions based on partial information and incorrect inferences, resulting in significant escalation. Alternatively, great uncertainty and extremely high stakes could reinforce caution if decision-makers in both countries have internalized the risks of escalation control and seek assistance to de-escalate the crisis. The most consequential trends affecting crisis management on the subcontinent are significant improvement in U.S.-India relations, significant deterioration in U.S.-Pakistan relations, and China’s far greater stake in Pakistan, as reflected in its “One Belt, One Road” investments across Pakistan to the Arabian Sea. As Washington’s penalties have become increasingly severe in response to Rawalpindi’s tightrope walking with respect to Afghanistan and anti-India extremist groups, Pakistan has turned increasingly to China for diplomatic support and military assistance. Beijing has willingly thickened ties with Pakistan as India accepts, albeit guardedly, an open invitation for closer cooperation with the United States. Other trends within the region also affect the realities and perceptions of crisis management. China-India relations have become more competitive, as reflected in occasional flare-ups — absent fighting — along both countries’ non-settled border regions. Neither Beijing nor New Delhi seeks a rupture in relations. India is on the rise but is slow to carry out essential reforms. Pakistan has taken important steps to address internal security threats but at this writing remains tethered to poor choices of the past. Pakistan does not enjoy good working relations with any of its neighbors, with the exception of China, whose support in an intense crisis with India cannot be assumed. The United States wishes to “rebalance” toward the Pacific but has insufficient agility and resources to do so because of its commitments in Iraq and Afghanistan. China has adopted a more muscular approach to its regional security concerns along its periphery; whether it chooses to do so on the subcontinent in the event of a crisis between India and Pakistan remains an unanswered question with important ramifications for crisis management. Prime Minister Modi is a well-established incumbent with significant political support, while Pakistan again faces political turbulence. India’s conventional capabilities are growing relative to Pakistan, while Pakistan’s nuclear capabilities are growing relative to India.100For more on this see Dalton and Krepon, A Normal Nuclear Pakistan. Also see, Shane Mason, Military Budgets in India and Pakistan: Trajectories, Priorities, and Risks (Washington, D.C.: Stimson Center, 2016). U.S. crisis management proved quite helpful in the two most intense crises examined above. However, China’s rise and the United States’ waning influence in Pakistan could affect how crisis management plays out in the future. Fostering a positive approach by Beijing toward crisis de-escalation has become increasingly important as Islamabad and Rawalpindi no longer view Washington as an “honest broker.”101For more on the history and possible future of China’s role in South Asian crises, see See Yun Sun and Hannah Haegeland’s essay in this volume, “China and Crisis Management in South Asia”. Nor does New Delhi expect Washington to play this role in the future. If Modi decides to push back against Pakistani provocations, New Delhi would expect U.S. diplomatic support. In past crises Beijing has exercised influence primarily by its unwillingness to come to Pakistan’s assistance in a crisis sparked by its own actions (or nonactions in terms of restraining extremist groups). Consequently, despite Beijing’s notional messages of support, Pakistan has not received material support during past crises, thereby clarifying its isolation. Beijing now has other means to convey cautionary messages, as its mere expression of concern over Chinese investments and the protection of Chinese nationals working in Pakistan are likely to carry greater weight in Islamabad and New Delhi. Beijing could seek to influence Indian behavior in a future crisis by veiled threats and by repositioning ground, naval, and missile forces. There would be precedent for such actions, most notably the movement of the U.S.S. Enterprise and its task force into the Bay of Bengal on two occasions — to signal Washington’s interest in Chinese restraint during the 1962 India-China War and Indian restraint in the 1971 India-Pakistan War. However, comparable actions by Beijing in the event of an intense crisis between India and Pakistan could risk emboldening Rawalpindi and strengthening opposition to Beijing’s actions elsewhere around its periphery, where neighbors are already concerned about a more muscular China. A China that “throws its weight around” would likely result in even closer ties between the United States and other countries around China’s periphery, including India. Plus, if Beijing comes to Pakistan’s military assistance in a crisis that is widely viewed as having been triggered by the actions of violent extremist groups based in Pakistan, China could be viewed as abetting state-sponsored terrorism, which it strongly opposes. Nonetheless, if an India-Pakistan crisis spills over to limited conventional warfare in which India takes the offensive, Beijing might resort to signaling to help bring an end to hostilities. For Beijing to become a co-equal partner with the United States in crisis management, it would have to be prepared to accept greater responsibility for regional security and more intense diplomacy geared to war prevention and de-escalation. This could entail greater risks for uncertain benefits, however. In the past, Beijing has felt comfortable watching Washington do the “heavy lifting” of crisis management, contributing only supplementary efforts. While China’s stakes in another serious crisis have grown, it is unlikely, in the view of Yun Sun, that Beijing would be eager to embrace a co-equal partnership role with the United States in crisis management.102 Yun Sun, “Create a Channel for a U.S.-China Dialogue on South Asia,” Stimson Center, Off Ramps Initiative, August 10, 2017, https://www.stimson.org/content/create-channel-us-china-dialogue-south-asia. Even though U.S. influence on Pakistan’s choices has waned, Pakistan still has no better option than Washington in seeking to de-escalate a crisis with India — even if Washington is not viewed as an “honest broker.” Washington still likely retains more influence on Pakistan’s decisions than Beijing has on India’s. Beijing’s support for de-escalation remains essential, however, with China focusing primarily on Pakistan and the United States focusing primarily on India in an intense crisis. In the event of another intense crisis on the subcontinent, U.S. crisis management would again be a top-down exercise. A senior U.S. official would need to be found to lead these efforts — ideally someone with experience in the region and in crisis management. If there is no such person available, the Trump administration might consider “deputizing” someone possessing these credentials. Washington might again argue against precipitous action and seek to buy time by choreographing high-level visits to the region. If, however, New Delhi preempts this familiar playbook by taking quick military action in response to a provocation, Washington would likely be understanding, if not supportive. The focus of crisis management would then pivot quickly to limiting further escalation. The U.S. intelligence community would again play a key role in helping leaders in India and Pakistan assess the disposition and readiness levels of conventional and nuclear capabilities, in rebutting unfounded rumors, and in tracking the activities of violent extremist groups. U.S.talking points might vary somewhat from previous crises, but key messages would likely remain constant. If New Delhi were to resort to “Cold Start” operations to seize and hold territory,103Walter C. Ladwig III, “A Cold Start for Hot Wars?” International Security 32, no. 3 (2007/08): 158-90. this would be unlikely to compel concessions from Pakistan. If successful, Cold Start operations would leave Indian forces stranded among hostile locals awaiting withdrawal orders.104Ajai Shukla, “Why General Bipin Rawat Acknowledged the Cold Start Doctrine,” The Wire, January 20, 2017. In this event, New Delhi’s image could shift from victim to aggressor, drawing international pressures away from Pakistan. In addition, launching even a limited Indian ground and air campaign would pose risks of nuclear use and uncontrolled escalation due to accidents, pressures on command and control networks, and the possibility of inadvertent detonations by warheads without adequate safety measures. Even in the absence of uncontrolled escalation and mushroom clouds, another war with Pakistan could diminish the rate of India’s economic growth — and distract from the task of managing a more assertive China. The risks to Pakistan of another limited war with India are equally great. A limited war with India could accentuate Pakistan’s diplomatic isolation (if New Delhi does not pursue seize and hold tactics), its domestic insecurity, and its economic difficulties. While China would likely support Pakistan in a crisis, at least notionally, Beijing would also be concerned about its growing investments in Pakistan. These investments could be jeopardized by another war with India. Beijing has assumed a standoffish posture in previous crises sparked by Pakistan, while Washington has moved into India’s “camp.” Pakistan might well find itself on the defensive if its actions — or failures to act against violent extremist groups — result in another war with India. Consequently, decision-makers in Pakistan, no less than India, have good reason to avoid another intense crisis and the prospect of another war with India. As in the past, these circumstances and arguments provide the basis for successful crisis management. In every crisis since the 1990 Compound crisis, Washington has abrogated to itself the role of principal crisis manager. In the past, leaders in both India and Pakistan were quite willing to support this role, welcoming U.S. crisis managers seeking to stay their hands. Washington still retains the ability to play the role of “extricator-in-chief” — with China’s help — if both countries seek to avoid uncontrolled escalation. Conversely, Washington will have great difficulties in crisis management if the contestants are not on the same page regarding de-escalation. The U.S. military campaign in Afghanistan figured prominently during the 2001-2 Twin Peaks and 2008 Mumbai crises, serving as one basis for Indian restraint. At the time of the December 2001 Parliament attack, the United States had recently deployed an expeditionary force of 2,500 soldiers to Afghanistan. The George W. Bush administration argued to the Vajpayee government that a war with Pakistan would damage the coalition war effort in Afghanistan. This was not the primary reason for Indian restraint, but it may have been a contributing factor.105Nayak and Krepon, US Crisis Management in South Asia’s Twin Peaks Crisis, 38-39. At the time of the crisis, U.S. troops were bearing down on the presumed hideout of Osama bin Laden in the Tora Bora cave complex, which was being bombed by the U.S. Air Force. When Indian forces mobilized after the Parliament attack, Pakistani forces on the Afghan border shifted east to take blocking positions. Whatever the likelihood was of Pakistani troops helping to corral or kill the Taliban leadership at the Afghan border, it ended with the Parliament attack. At the time of the 2008 Mumbai attack the United States had an expeditionary force of almost 31,000 troops in Afghanistan. Pakistan’s logistical support through the port of Karachi, and thence overland through Pakistan, was essential to the prosecution of this war. Again, the Bush administration argued that by going to war with Pakistan, New Delhi would do grave harm to a war effort that served India’s national security interests.106Nayak and Krepon, The Unfinished Crisis, 29. These circumstances have changed. U.S. and allied force levels in Afghanistan are greater than during the Twin Peaks crisis and far below those during the Mumbai crisis. The requirement for Pakistani logistical support remains, but U.S. coalition support funding for Pakistan is dwindling. Moreover, Washington’s expectations that Rawalpindi can help “deliver” Afghan Taliban leaders to a negotiated settlement are low. Consequently, if there is another crisis on the subcontinent, U.S. interests in Afghanistan are neither unlikely to buttress Pakistan’s position nor complicate India’s choices as much as in the Twin Peaks and Mumbai crises. For every reason to hope that severe nuclear-tinged crises might be in the rear-view mirror, there is a corresponding reason to expect another one. Indian Prime Ministers from both Bharatiya Janata Party- and Congress-led coalitions have looked hard at the precipice of escalating warfare under the nuclear shadow and have walked away, deciding the gains would be ephemeral and pains long-lasting. They have instead chosen the path of restraint and the acceptance of temporary embarrassment. Prime Minister Modi might well think and act differently — but this does not mean that uncontrolled escalation would necessarily follow. The primary sources of crisis stability within India to date have been the priority New Delhi has placed on economic growth, the paucity of important targets within Pakistan-administered Kashmir, the high sensitivity of striking important targets elsewhere, and its concerns over uncontrolled escalation. We do not know the extent to which Rawalpindi has internalized how much Pakistan has been hurt by previous crises, even when New Delhi has decided to stand down. Nor do we know whether a nearly decade-long record of non-intense crises can be attributed to private understandings between Pakistan’s military and intelligence services and violent extremist groups to avoid high-profile events that would spark a serious crisis. If these considerations are in play, then additional factors militating against uncontrolled escalation exist on the Pakistani side. If Rawalpindi takes visible and nonreversible steps against anti-India extremist groups, Pakistan’s claims of innocence will receive a fair hearing and the potential to defuse a crisis and escalatory moves will grow. Conversely, until Rawalpindi clarifies responsible policies toward anti-India groups, presumptions of collusion and the potential for uncontrolled escalation will remain. There is reason to hope that Rawalpindi has internalized the lessons of Kargil as well as the Parliament and Mumbai attacks. The Kashmir cause has not been advanced by these dangerous misadventures. Whenever Rawalpindi has sought to change the status quo in Kashmir by such methods the status quo has been reaffirmed, while Pakistan’s standing has been deeply diminished along with its economic prospects. Rallying to the Kashmir cause has advanced neither Pakistan’s well-being nor that of Kashmiris. Instead, New Delhi’s position in Muslim-majority areas has been undermined by its own heavy-handed approach to governance in Kashmir. Breathing room can only be found in a relaxation of tensions between India and Pakistan as well as in a relaxation of New Delhi’s grip on the valley. And yet, the moral imperative of associating with the Kashmir cause and the instinct to inflame India’s Achilles’ heel have been staples of Pakistan’s existence. The potential for new crises exists because the pall cast by nuclear weapons has not yet encouraged sustained efforts to improve ties between India and Pakistan. Nor has it yet concretized the “ugly stability” short of warfare predicted by noted analyst Ashley Tellis.107Ashley J. Tellis, India’s Emerging Nuclear Posture: Between Recessed Deterrent and Ready Arsenal (Santa Monica: RAND Corporation, 2001), 131. In the near-decade since the last intense crisis, diplomatic efforts to normalize ties have been easily blocked by minor provocations that have not even risen to the level of a crisis. The recent absence of intense crises at this writing provides no surety for the future. Modi has upped the ante by publicizing the common practice of attacking posts across the Kashmir divide. By setting the precedent of publicizing a sharp response after an attack by cadres from anti-India extremist groups, Modi would appear to be obliged to respond in similar fashion in the future, calibrated to the provocation. The next time this occurs Rawalpindi is likely to be ready with a “befitting” response. The fourth step in this ladder will be crucial in determining the extent to which escalation could be controlled. Chari, Cheema, and Cohen predicted in 2007 that the next crisis on the subcontinent would be unique but would also share earlier elements of surprise and danger.108Chari, Cheema, and Cohen, Four Crises and a Peace Process, 205. The 2008 Mumbai crisis confirmed their prediction. The next major crisis could evolve from the dynamics of hostility along the Kashmir divide as noted above. Another route to an intense crisis could be yet another attack against an iconic structure in or near a metropolitan area in India. Those that hate India enough to carry out such an attack hate its promising rise, so the target of their attack might again symbolize India’s rising power and connectivity to the world. There is no shortage of soft targets in India, no shortage of means to inflict damage, and no shortage of recruits to carry out attacks. Would another dramatic attack against a symbol of India’s rising power or an equivalent outrage prompt a strong military response? As noted by one of the authors five years ago: “[t]he reasons for India’s prior restraint despite severe provocations remain in play and in some cases have become more pronounced.”109Michael Krepon, “Crises in South Asia: Trends and Potential Consequences,” in Crises in South Asia: Trends and Potential Consequences, ed. Michael Krepon and Nathan Cohn (Washington, D.C.: Stimson Center, September 2011), 11. This remains the case, but the prospects for escalatory actions are greater now than five years ago. New Delhi might again choose to exercise escalation control, in part due to the absence of significant military targets across the Kashmir divide.110George Perkovich and Toby Dalton, Not War, Not Peace? : Motivating Pakistan to Prevent Cross-Border Terrorism (Oxford: Oxford University Press, 2016), 165-68. Significant targets associated with violent extremist groups in Pakistan’s southern Punjab remain obvious but continue to pose serious risks of escalation. At the end of the day, fighting Pakistan continues to remain a detour to India’s rise. And yet, Indian forbearance, especially in the Modi government, cannot be taken for granted. Nor can escalation control, no matter how strongly desired. Another big explosion could occur at any time, whether by accident, a breakdown in the chain of command, extremely rash acts by risk-taking decision-makers, or the provocations of wild men. Unrest in Kashmir could spiral into another major crisis. In the event of these scenarios, external crisis management will again be sorely needed. Before the advent of nuclear weapon capabilities on the subcontinent, unresolved grievances over Kashmir resulted in wars. With the advent of the bomb, unresolved grievances have led to mass casualty terrorism, crises, and one limited conventional war. Crises have reoccurred because underlying grievances have not been addressed. In this essay, we have reviewed five crises over a three-decade period. Some crises were preceded by ambitious diplomatic overtures, others by diplomatic lethargy. Notably, there have been no significant crises on the subcontinent since 2008. The most serious of the crises covered in this essay — the Kargil War and the Twin Peaks crisis — occurred in 1999 and 2001-2. As such, it is possible that the worst nuclear-tinged crises on the subcontinent are a reflection of a more troubled past. This sanguine future cannot be confidently presumed, however. The conditions for another major crisis — widespread disaffection in Kashmir, spoilers in Pakistan, risk-taking personalities, accidents, breakdowns in command and control, or some other form of misfortune — remain present. Since the 2008 Mumbai crisis, Indian leaders have been unwilling to seek sustained and dramatically improved ties with their western neighbor, and since 2008, Pakistan’s leaders have given them scant reason to try. Under these circumstances, the next severe crisis could happen at any time. While some factors in crisis management have changed, the fundamentals of the U.S. crisis management playbook have not. New Delhi has more conventional military options, but these options could lead to quagmires or uncontrolled escalation. Rawalpindi has more nuclear options — including the option of using short-range missiles and perhaps other kinds of “tactical” nuclear weapons to blunt an Indian conventional offensive — but the dangers of doing so would be severe and open-ended. Pakistan would also be perceived as a pariah state, having first prompted another limited war with India and then crossing the nuclear threshold first. Another limited conventional war between India and Pakistan would leave far more to chance than the Kargil War. Cautious leaders in India and Pakistan will try very hard to avoid uncontrolled escalation. Two key questions are whether Pakistan’s decision-makers will work equally as hard in avoiding actions that could trigger another crisis and whether India’s leaders will seek sustained diplomatic efforts to improve relations. Because the spark for every crisis since Operation Brasstacks has come from within Pakistan, the burden of crisis avoidance falls primarily on Rawalpindi. If another intense crisis occurs, there are compelling reasons for national leaders in India and Pakistan to once again seek to control escalation. Crisis management by the United States can again help defuse a crisis and prevent a war that leaders in India and Pakistan do not want. If, however, another limited war occurs on the subcontinent, intense diplomacy and crisis management will be required to prevent further escalation. The authors wish to thank Vinod Kannuthurai, Eyal Hanfling, Gaurav Kalwani, Richa Bhatia, and Allyson Rimmer for their research assistance. Michael Krepon received the Carnegie Endowment's Thérèse Delpech Memorial Award in 2015 for lifetime achievement in nongovernmental work to reduce nuclear dangers. Krepon co-founded the Stimson Center in 1989, served as Stimson’s President and CEO until 2000, and continues to direct Stimson’s programming on nuclear and space issues. He was appointed the University of Virginia’s Diplomat Scholar, where he taught from 2001-10. He is the author and editor of 21 books, most recently The Lure and Pitfalls of MIRVs: From the First to the Second Nuclear Age (Stimson Center, 2016). He worked previously at the Carnegie Endowment for International Peace, the U.S. State Department’s Arms Control and Disarmament Agency during the Carter Administration, and on Capitol Hill. Olivia "Liv" Dowling was a Research Associate in the Stimson Center's South Asia Program. Her research interests include South Asian nuclear stability, defense cooperation, strategic cultures, and U.S. relations with the subcontinent. Before joining Stimson, Liv interned in the Office of India Affairs at the U.S. Department of State, served as an American India Foundation fellow in Gujarat, and conducted independent research on Indian domestic politics at Jawaharlal Nehru University in New Delhi. She holds a M.P.A. from the Woodrow Wilson School of Public and International Affairs at Princeton University and a B.A. in Political Science and International Studies from Yale University.